Spain’s central government and Catalan authorities clashed on Saturday over who controls the regional police force seen as key to the success of a planned Oct. 1 independence vote. The State prosecutor in Catalonia told all local and national police forces they had been temporarily placed under a single chain of command, reporting directly to the interior ministry in Madrid. But Catalonia’s interior chief, Joaquim Forn, said his department and the local police — or Mossos d’Esquadra — rejected this decision. “We denounce the attempt by the state to control the police forces of Catalonia,” Forn said in a televised speech. The Catalan police are the largest police force in the region and have been criticised for not being firm enough in cracking down on the Oct. 1 vote. 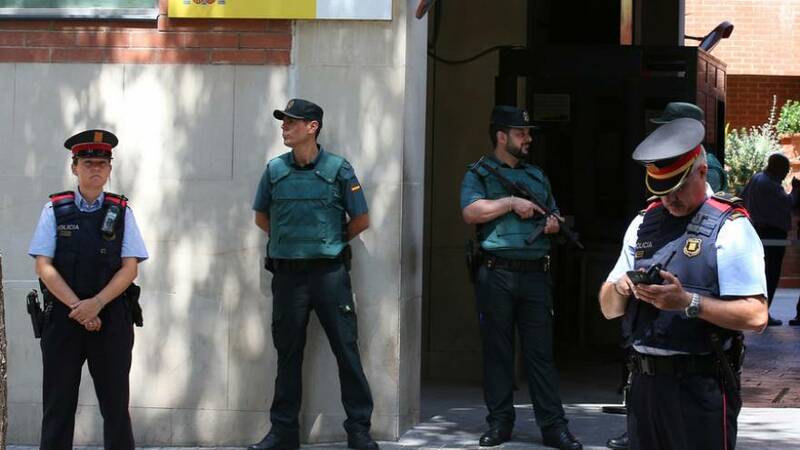 The Mossos are one of the symbols of the region’s autonomy and for many Catalans, the move could carry echoes of the 1936-39 Spanish Civil War and the dictatorship of Francisco Franco, when the Mossos were abolished. The central government representative in Catalonia, Enric Millo, also called on Catalan leaders, including Forn, to stop encouraging street protests and demonstrations. Catalan newspaper La Vanguardia said the prosecutor’s order would remain in place until at least Oct. 1, when the vote is due to take place. Several pro-independence groups have called for widespread protests on Sunday in central Barcelona. The Catalan government opened a new website on Saturday, with details of how and where to vote on Oct. 1, challenging several court rulings that had blocked previous sites and declared the referendum unconstitutional. “You can’t stem the tide,” Catalonia’s president Carles Puigdemont said on Twitter, posting the link to the new website. The political fever has reached universities, with hundreds of students occupying a campus in Barcelona to protest the government’s crackdown. Spanish Prime Minister Mariano Rajoy has insisted the vote is unconstitutional and should not go ahead. “It will not happen because this would mean liquidating the law,” Rajoy said at an event held by his People’s Party (PP) in Palma de Mallorca, in Eastern Spain. Acting on court orders, the Spanish state police has already raided the regional government offices, arrested temporarily several senior Catalan officials accused of organising the referendum and seized ballot papers, ballot boxes, voting lists and electoral material and literature. The finance ministry in Madrid has also taken control of regional finances to make sure public money is not being spent to pay for the logistics the vote or to campaign. Between 3,000 and 4,000 police officers coming from other Spanish regions have already arrived in Catalonia or are on their way. They will join 5,000 state police already based in the region and 17,000 local Mossos.